Poetic Kinetics transforms public spaces with their kinetic art. 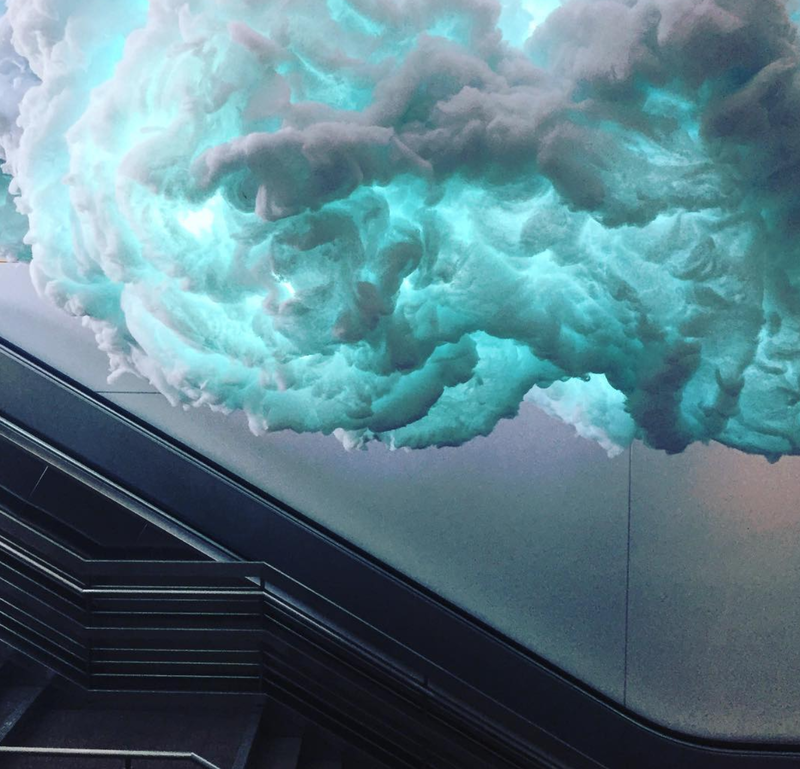 The group, based in Los Angeles, has created site-specific work all around the world. I'll call out a few exceptional pieces that stood out for me, but you should really click on over to the Poetic Kinetics website and YouTube channel to get a broader sense of their work. 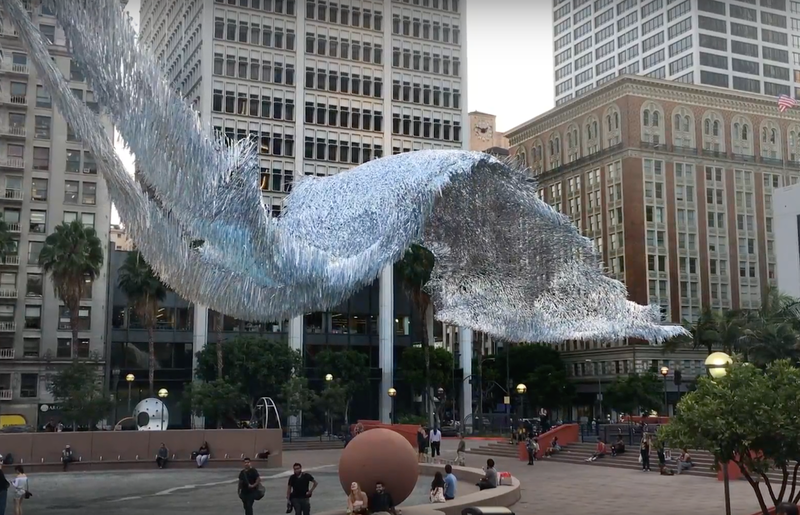 Liquid Shard, pictured at the top of this post and in the video embedded below, was a large-scale sculpture made out of holographic mylar and monofilament installed across Pershing Square in downtown Los Angeles. The wind and air currents in the square cause the piece's two layers to rise and fall from 15 feet off the ground to 115 feet in the air. Escape Velocity, a giant mobile Astronaut amazed fans and performers during the Coachella Music and Arts Festival, hovering over concertgoers and interacting with them as they passed by. Radio-controlled animatronics gave the Astronaut the ability to articulate life-like gestures, such as peace and thumbs up signs. Video projection mapping allowed participants to have their face projected into the helmet visor as well as have their name appear on the suit’s nametag. 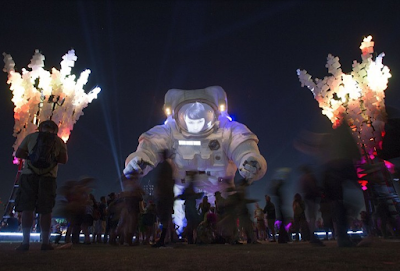 There's a cool YouTube video of the creation and installation of the Astronaut here. Nimbus is an installation that transforms a transitional space into a performance site. The installation acts as a timepiece for Walt Disney Concert Hall as Rand Steiger’s commissioned music changes over the course of the day, alternating between computer generated musical atmospheres and compositions built from material recorded by soloists from the Los Angeles Philharmonic. These pieces, spatially distributed over 32 speakers, alternate with periods of silence interrupted by briefly related sounds triggered by motion sensors. Let the Poetic Kinetics website and YouTube channel inspire you to think of new ways to transform the public spaces around you and your museum!